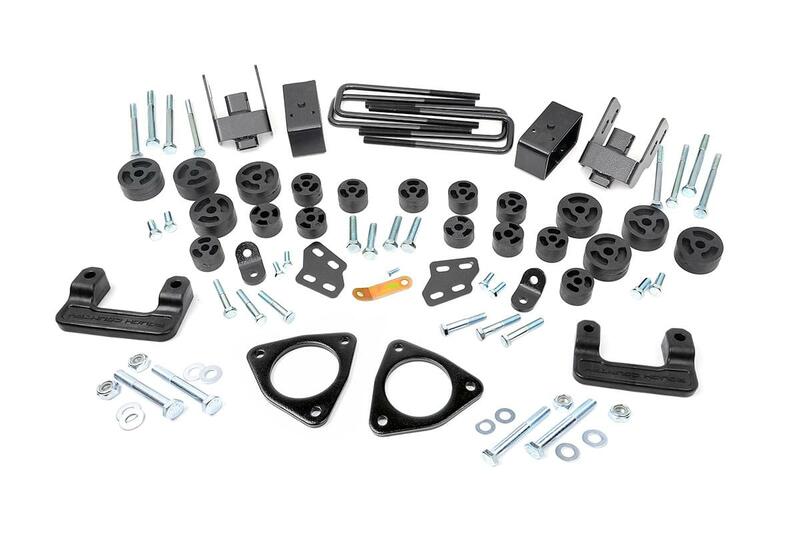 Get the best of both worlds with Rough Country`s 3.75-inch Combo Kit for 2007-2013 GM 1500`s! This unique kit combines our popular 2.5-inch Leveling Lift Kit with our 1.25-inch body lift, offering you a big boost at an incredible price! Gain enough ride height to run up to 285/75 R17 tires with a set of lower strut extensions, rear blocks, and a set of fiberglass reinforced nylon spacers. Best of all this kit ships with a set of bumper relocation brackets and instruction for lifting the rear bumper using factory mounts, giving your truck a clean, flush look after lifting. Includes a Lifetime Replacement Warranty and is certified FMVSS no. 126 Compliant, proven not to interfere with Electronic Stability Control feature on new model trucks.